Barrel: 16" 4150V Chrome Moly Vanadium steel phosphate barrel, chambered in 5.56 NATO, with a 1:7 twist, M4 barrel extension, and a Mid-length gas system. The barrel is finished with with a .750" diameter low-profile gas block, PSA 13.5" Lightweight M-Lok Free Float Rail and an A2 flash hider. Upper: Forged 7075-T6 A3 AR upper is hard coat anodized black for durability. Featuring M4 feedramp cuts, these upper upper receivers are made for us right here in the USA. How do you mount a forearm grip with no rail underneath? BEST ANSWER: Just need a Mlok grip. Works great. Is a stripped lower all this kit needs to make it operational? BEST ANSWER: Yep, that's it! Well...that and a little time and patience. 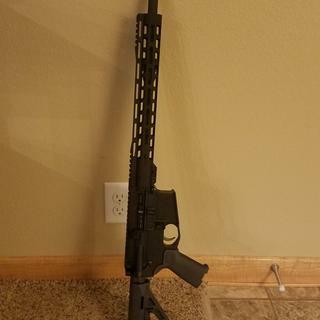 I had an experienced friend help me through the process and had a completed AR in a little over an hour. Yes, except you’ll also need a mag and ammo to head to the range once built. To build the kit you would also need a few tools. All you need is the stripped lower receiver. This is undoubtedly the best kit I’ve ever bought, and I plan to buy another. Yes but you will need to get a magazine to go with it as one is not included with the kit. Yup. And a magazine, of course. Everything else is included. A stripped lower and a few tools is all you need to build. Yes that is all you need, very good build kit. You will need a stripped lower and a magazine. Yes, assuming you already have magazines. Does it get ship to my house or do I have to pick it up at a gun store? BEST ANSWER: There’s no lower on this which is the only serialized part that’s required to go thru a FFL. So it should ship straight to your door. 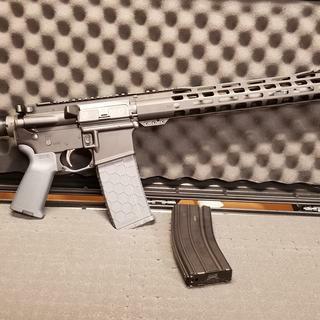 It’s says gray, is that the grip only? BEST ANSWER: The buttstock, grip, and trigger guard are all grey. So I need to know is my Purchase going to be sent or not if not I would like to know ??? Is this free shipping here in hawaii? Is this free shipping un hawaii? This 1/7 twist barrel won't shoot anything lighter than 60 grs with any kind of acuracy. The common 55 gr. fmj is a crapshoot. some bullets go where you want them to go, some don't. The upper functions great with anything I put through it, some just not very accurately. This is my fourth build with this kit and its the best for the price for sure. Just add your lower and its complete. I bought the AR15 Rifle Builders Manual off Amazon. I had to buy some tools. Within a couple of hours I had a nice AR ready for the range. The Magpul pistol grip was a real pain to seat. I had to do some filing on it. It is a bonus that the upper is already assembled. Great kit. Every thing I need except a stripped lower. Very happy with the rifle overall. Very nice kit, even before I switched out some parts. I've only put about 200 rounds through it so far but its been great. The EPT trigger seems to be worth every damn penny of the $30 that PSA sells them for separately. The rail is very nice. Judging by the MI the I noticed on the rail it's most likely a Midwest Industries rail. But it seems slightly different than any currently offered MI rails, so it may be a design made just for PSA. The Magpul furniture is exactly what anyone familiar with Magpul would expect. Sure Magpul isn't always the best but they make very good stuff and at prices that most people can afford. I did switch out a few parts on this build. First was the mag release, installed an Armaspec extended release purchased from PSA. Second was a Seekins enhanced bolt catch that I had laying around. Third was a Magpul ACS-L stock, also had laying around. And the last was a Magpul K2+ grip that I purchased locally after trying different grips. But everything in the PSA kit installed as it should, has functioned well so far, and accuracy was as good as I can personally expect using a Sig red dot (or the included MBUS) while shooting standing/unsupported. I plan to either buy a magnifier for my Sig red dot or install a scope, but I have no doubt that the accuracy will still be acceptable. Oh and if you're accustomed to shooting AR-15s with a carbine length gas system, I can now highly recommend trying one with a mid-length gas system. A 5.56 carbine length AR doesn't have a terrible amount of recoil but a midlength is just that much smoother. Iss almost as nice as some or the $2000+ gas-piston ARs that I've shot. Just very smooth and gentle recoil. Makes getting back on target quicker. Can't beat the price and quality put 200 rounds through it this weekend not one misfire or malfunction due to the rifle. 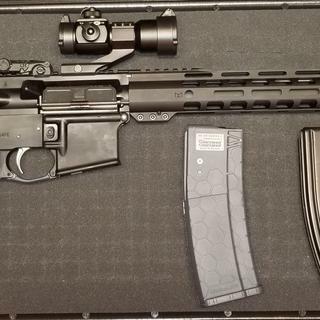 This was my first purchase from palmetto State armory , I received the package faster than expected and it was easy to assemble and of great quality . I'm writing my wish list now !!! Great product and service. Love the ease of assembling and the quality. PSA customer for life. I ordered this product on a Monday night and it arrived the following Thursday morning. It was faster free shipping then I have received anywhere else. All the parts came in individual bags so it was easy to distinguish what parts went with what. There were no blemishes on any of the parts or the upper. Once assembled it fired and worked great. 100% recommend for first time builders.